Connecting Part: Well hot-dip galvanized steel parts. Fabric standard: 100% waterproof, UV resistant, flame retardant. Max allowed wind: 100km/hour (0.5kn/sqm). Lifespan under well treatment: 15 years for main frame parts, 5-8 years for cover fabric. 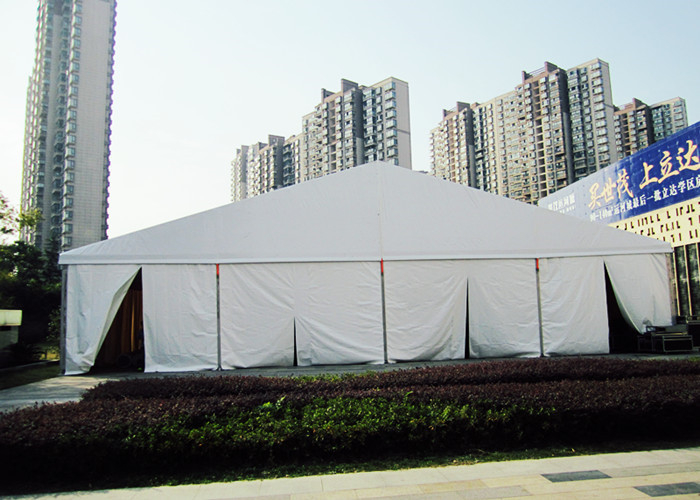 The 600 sitting capacity tent with size 20x30m is made of aluminum structure. Height of eave usually 3 meters or 4 meters. The main structure is made of highly extruded aluminum frame, anti rust and durable in quality, which can be used over decades. The main frame is 6061T6, size 112x203mm. It is very heavy duty. The roof and the side walls are covered by double coated waterproof PVC, thickness between 650-850gsm. If customer like, you can replace with clear covers. 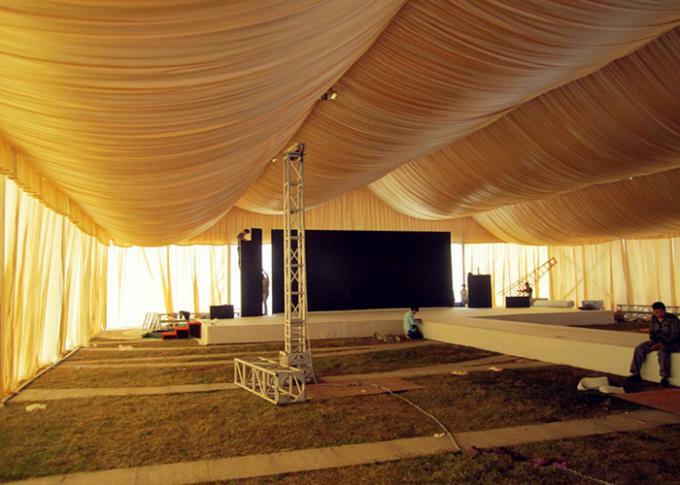 20X30m wedding tent is mostly used for wedding parties which will accommodate around 600 people. The space can include the tables and chairs for same population. Choosing a great sight seeing land, such as grass land in a beautiful park or a flat land in a green mountain space, or a river side site, when you locate your wedding party in this nice tent, it will be an amazing view itself. With flowers around and curtain linings as decoration, it will certainly give you a remarkable memory for your important moment. 1. Longer life span than other types of tent. 2. You can increase or decrease the length freely. 3. Easy to mantle it and dismantle it. 4. More environmental friendly because it can be quickly moved away after used. 5. Compared to other types of tent, it is more flexible to decorate the tent inner space. 6. Compared to other solutions, it is much cheaper in cost and more beautiful in outlook.